Your laying hens have different nutritional needs from roosters or chickens you might raise for meat. If you provide your flock with a high-quality feed designed for laying hens, you probably don't need to use vitamin supplements. However, if your hens' production falls off, or shell quality is poor, adding some vitamins to their diet might improve the situation. A lack of certain vitamins can produce symptoms in the hen and evidence in the eggs. Vitamin A deficiency results in fewer eggs. A lack of vitamin D also results in fewer eggs, along with thinner shells. Other vitamin deficiencies affecting egg production include choline, folic acid and riboflavin, also known as vitamin B2. If you're raising chicks, be aware that a lack of vitamin B12 can result in embryo death. Vitamin A and D deficiencies both result in poor growth, with the latter also possibly causing rickets. Large hocks are a sign of vitamin E deficiency, while insufficient vitamin K results in intramuscular bleeding. The B vitamins are especially important to laying hens. A lack of thiamine, or B1, causes hens to lose their appetites and die. Too little B2 can cause curly-toe paralysis, while not enough B12 results in poor growth and anemia. Lack of biotin and pantothenic acid produces dermatological lesions on the feet and beak, while insufficient niacin can cause mouth and tongue inflammation and bow legs. Too little choline results in fatty liver, while lack of folic acid causes anemia and poor feather quality. You might want to supplement your flock with multivitamin supplements if you notice issues with egg production or quality, or your laying hens aren't looking as well as they should. 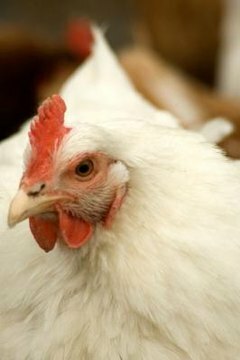 Since minerals are also important to poultry health, you might want to buy a complete multivitamin-mineral supplement. Multivitamin supplementation can also help during periods of stress or extreme heat. Depending on the product, you can mix the multivitamin supplement either into the feed or into the water. Whichever route you choose, make up only enough to last a short while. You should give your hens fresh water daily, and don't mix the multivitamin supplement into an entire bag or storage container of feed. Mix in enough for several days' rations. Many multivitamin poultry products are available, so deciding which ones are best for your particular flock takes some consideration. Since some vitamins deteriorate with storage, pay close attention to package expiration dates. Also check to see if the packaging requires the product to be used at once, or if it can be resealed for use over a prolonged period. Look at package claims. Only veterinary products can treat actual diseases. Ask your county agricultural extension agent for recommendations. How Do Egg Laying Crumbles Work?